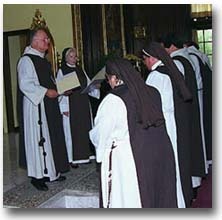 Sisters and Brothers of the Order making annual renewal of their holy vows. The History of The Order of Saint Andrew began in 1986 with the formulation of our Rule, Constitution and Customary. Our mission is shared by a First Order of vowed Brothers and Sisters and by a Third Order of Associates. The goal of members of the Order of Saint Andrew is to glorify God through worldwide apostolic ministry.